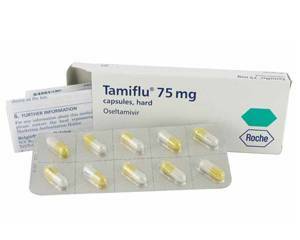 Tamiflu is used to treat infection with the influenza (flu) virus. It contains the active ingredient oseltamivir, which is a type of medicine called a neuraminidase inhibitor. Oseltamivir prevents the flu virus from spreading and infecting other cells. Tamiflu can also be used to prevent infection with the flu virus. If infection has already occurred, it has been shown to reduce flu symptoms and the duration of the flu. Tamiflu is used to treat and prevent the flu. It can be used for various types of flu, including seasonal flu, H1N1 influenza (swine flu) and bird flu. Tamiflu capsules should be swallowed whole with water, preferably with food to avoid or reduce stomach distress or nausea. It is important to complete the prescribed course. Stopping early will give the virus the chance to spread. Adults and children aged 13 and above: one 75-mg capsule once daily for 10 days, preferably taken in the morning. Start taking Tamiflu within two days of being exposed to the virus. Adults and children aged 13 and above: one 75-mg capsule twice daily for five days. Start taking Tamiflu within two days from the onset of symptoms. For children weighing 40 kg or more the recommended dose for treating the flu is the same as in adults, unless the doctor advises otherwise. Smaller sized capsules are available for children who find swallowing a 75 mg-tablet difficult. In this case, each dose consists of two capsules: one 40 mg-capsule and one 35 mg-capsule. Young children and babies should be given the appropriate dose in the form of a suspension (oral solution). Always follow the prescription exactly - never take more or less than the doctor recommends. Read the package leaflet before use. Nausea, stomach ache, vomiting. These side effects usually only occur during the first two days of treatment and will disappear on their own. You are allergic to the active ingredient oseltamivir. If you have a kidney disease or other serious health problem, consult a doctor before using Tamiflu. Tell the doctor what medicines you are using when you order. This is to avoid potential interaction between drugs and to make sure that the combination is safe. Do not use Tamiflu if you are pregnant or breastfeeding without consulting a doctor first. Tamiflu does not interact with alcohol or affect your ability to drive safely.